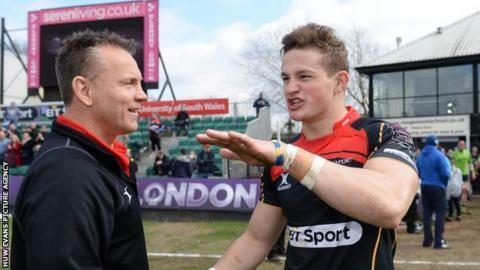 Newport Gwent Dragons are "just inches" away from from turning narrow defeats into victories, says head coach Kingsley Jones. The Welsh region go into their European Challenge Cup quarter-final at Gloucester after seven consecutive Pro12 defeats. "It's a difficult challenge. I can't remember too many times it's happened, but it's just inches away," said Jones. Dragons reached the Challenge Cup semi-final in 2015, while reigning champions Gloucester have lost four games on the trot. Dragons make just one change from their most recent defeat by Ospreys, with Nick Crosswell preferred to Matthew Screech at lock. In spite of their recent poor form, Jones does not believe the Dragons are underdogs. "If we were getting hammered then we'd have problems but I don't think that's the case and I don't think the players feel that," he said. "We go into this game with everything to gain and not a lot to lose, I don't think we're anyone's favourite. "We have to be realistic, it's no good kicking the boys in the belly when we lose." Flanker Lewis Evans, a previous regional captain, takes over the leadership from Taulupe Faletau, with regular skipper T Rhys Thomas still injured. "We haven't given them [the supporters] much to cheer about recently so going away to a tough place like the Shed [at Kingsholm] is going to be a good opportunity to put a few wrongs right," added Jones, a former Gloucester captain. "We [the forwards] have got to take a bit more responsibility to give our superstar backs an opportunity to go at them." Jones says the coaches feel no pressure despite rare booing from some members of the crowd during the Ospreys defeat. Chief executive Stuart Davies, launching plans for the current board and Welsh Rugby Union to appeal for new investors, accepted the region's finances are reflected by the lack of strength in depth. "We want to more money into the squad so it's got more depth and more quality," said Davies. "We have got an incredibly exciting batch of young players. Keeping them together is part of the thinking and together we've got a bright future if you lay on top this fresh investment. "We really haven't seen the best of the Dragons this season but the potential remains huge."